Stir in Potatoes, Sauce Mix and hot water. Heat to boiling; reduce heat. Simmer uncovered 22 minutes, stirring occasionally, until potatoes are tender. Stir in corn; sprinkle with cheese. 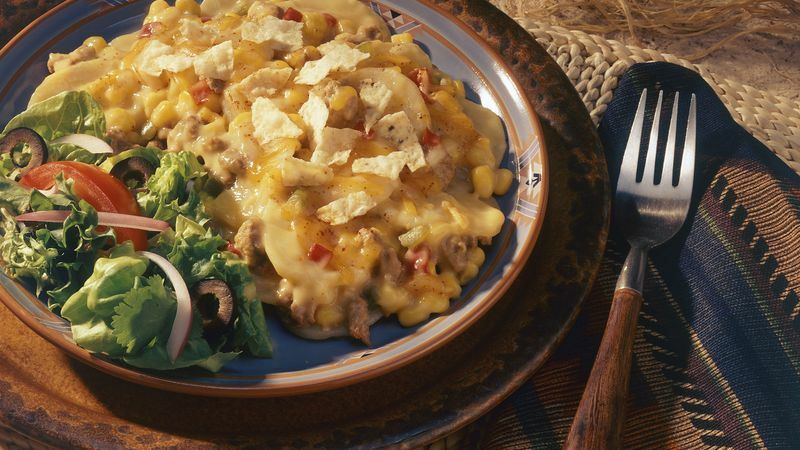 Cover and simmer 2 to 3 minutes, without stirring, until corn is hot and cheese is melted. Sprinkle with tortilla chips immediately before serving. Like a little kick? Just use jalapeño-flavor cheese and spicy tortilla chips. Dress up a weekend dinner by topping this casserole with salsa, sour cream, sliced green onions and chopped fresh cilantro.